The LANforge Hardware installation documentation covers installing rack-mount chassis designed to fit into a 19-inch frame. This documentation also covers adding an additional ethernet card to an existing chassis. This document assumes that you have obtained your hardware from Candela Technologies or a licensed distributor of LANforge equipment. If you are running LANforge on your own hardware, then most of this document will not directly apply to you, though it may still offer you some useful information. In addition to the contents of your package, there are other hardware requirements you need to satisfy before you can configure the LANforge equipment for the first time. Ethernet cable (CAT-5, RJ-45 ends). Once configured for the local management network, all items except the ethernet cable are no longer required for the traffic modules. The monitor, keyboard and mouse are not mandatory for the host modules but are recommended to ease usability of the system. The traffic modules are 19' rack mountable modules. The modules can be mounted vertically within the same rack with minimal air gap. The traffic modules need not necessarily be co-located to work together: As long as the same management network is used to connect all the traffic and host modules, the devices can be remote. Unless you are upgrading a Data Generator in the field, you will not need to install any Ethernet Port Cards, as they come pre-installed. However, for upgrades, here is the general procedure. Candela Technologies will work with you to understand your environment and give more detailed instructions if needed. Power down the LANforge Data Generator that you wish to install the Ethernet card into. Do this gracefully by following the power-down procedures for your particular operating system. For linux, you can run: init 0 as the root user. After removing the machine cover, locate an empty PCI slot and mount the new card. Re-assemble the unit and power it up. The LANforge manager (and GUI) should discover the powered up machine and it's new interfaces. If you are generating network traffic on these interfaces, you should use the LANforge-GUI to set up the IP information for each of the new ports. When you add a new ethernet card, the physical port's relationship to the logical device (eth1, for example), may change. You will want to test the new port layout with cross-over cables, or some other method of your choice, to ensure that your cable setup is (still) sane. Connect the Management ports of all modules to a network. Each module, traffic or controller, contains a management port, which should be labeled as such. Connect all management ports to a network that will be independent of the testing network. This may typically be a site management network of some sort or an exclusive network for the LANforge management traffic. It can be as simple as a 10/100bt ethernet hub or switch. 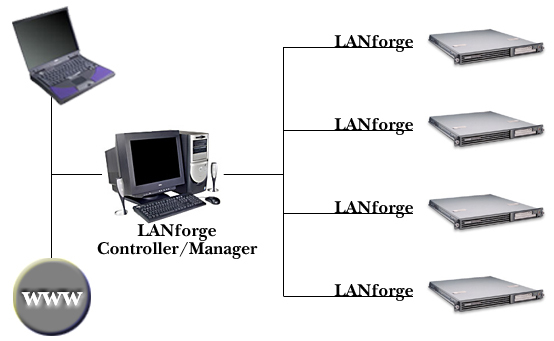 NOTE: Due to the discovery process that the LANforge Controller uses, you should never have more than one controller on the same management network unless the Controllers are configured for different 'realms' in lfconfig. NOTE: If you supply Candela Technologies with this information at purchase time, your equipment will come pre-configured, so that all you have to do is power up the systems! NOTE: ONLY change the management port (probably eth0), the LANforge GUI can be used to change the data-generating ports. This section describes the configuration needed to begin use of the LANforge system. Before starting, the network administrator should decide on a unique IP address, a subnet mask, a default gateway, a host name and the domain for each module (traffic and host). The monitor, keyboard and mouse are optional now for this module. Note: it is recommended that the monitor, keyboard and mouse be maintained on the host modules for ease of use. Repeat this procedure for all the modules that need configuration. This section attempts to help resolve some of the more common problems that users experience. If, after reviewing this section carefully, the problem is still present, please contact Candela Technologies technical support at support@candelatech.com. Module does not appear to power up. Verify that the module is plugged into a working 120VAC outlet. Use something better than a screw-driver to confirm a working power source!! Some systems have very small power buttons on front. Make sure you've pressed the right one! Keyboard and mouse do not work. If the keyboard and mouse were not present when the module was rebooted, or they were removed after booting, they may not function. Telnet to the module, grant super user privilege and type the shutdown -h now command to halt the system. Power down the system, attach the keyboard and mouse, and power up the system. Module appears to power up but won't respond after a power cycle. If the module was powered down abruptly, file system corruption may have taken place. Allow 10-15 minutes for the system to boot and clean the corruption. If after this time the module still does not respond, connect a monitor, keyboard and mouse to the processor card on the module. If the system has indeed stalled during a file system fix, it may require user input. Follow the instructions on the screen to clear the problem. Note: it may be necessary to power cycle the module after the keyboard and mouse are attached. Contact Candela Technologies if problem persists.